I had the vcleat.com staff compile all the successful sales in 2016 of new old stock (NOS) Florsheim Shell Cordovan models. There were a few additional NOS listings which never completed and I excluded those. I don’t care about those. Just closed sales. So if you didn’t sell one of these pairs, put that coffee down. Coffee is for closers only. 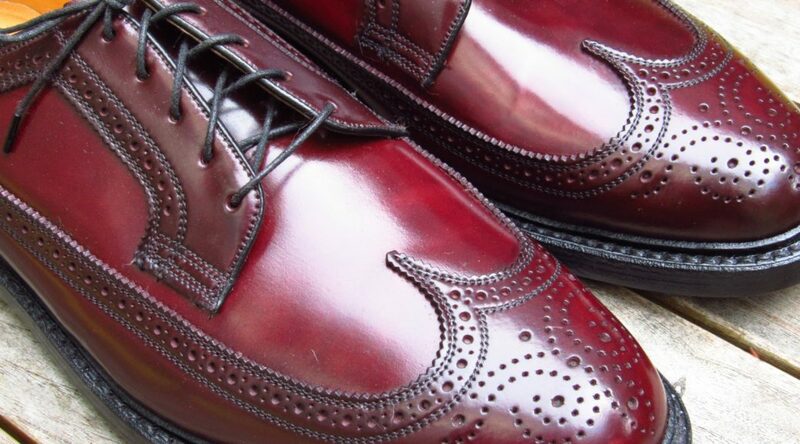 There were 26 NOS Shell Cordovan pairs sold in 2016. That’s not a lot. Don’t see your size? Join the club. I haven’t seen a 11.5 D NOS ever. Also, there was just one pair listed as “wide”. There was a wide range of prices but if the price was lower than $200, the pair went quick. Like minutes. Who are these people who constantly monitoring eBay for bargains? And how can they be stopped? I need a pair. Preferrably in my size. I added details about each listing and a link back to the original listing on eBay. The link may or may not work after a period of time. eBay deletes listings after a period of time. I also made a few comments for each pair. I expect more sales next year. Don’t disappoint me. You don’t want the 3rd prize. Remember – Always Be Closing. Comments: This is a rare example of a late 1990s version of the 97626. Seller underpriced this one and it went fast. Comments: 1980s model. Beautiful shoes. Sold quickly due to the low price. RARE VTG NOS FLORSHEIM SHELL CORDOVAN PLAIN TOE BLUCHER SZ 7 !!! Comments: This is a remarkable 1963 pair. The pair went for a good price. We probably won’t see another NOS 32601 for some time. Comments: This listing included the box and bags. 1992 model. This was a good deal for the buyer. Comments: Early 1990s model. I was surprised this listing was one of the highest priced pairs. Usually there is less demand for narrow sizes. But you just need one buyer for a successful sale. Florsheim Yuma Slip On Loafers SZ. 10 D Wine Brand New. Very Rare. Comments: 1980s model with box. The seller lists the pair as “Very Rare” but puts a Buy It Now price of $55. The seller obviously did some research but failed on the pricing. I am not giving this seller the Glengarry leads. No. Comments: 1986 pair that included the original box. Heels were replaced. Comments: 1997 model. Sold in 12 minutes! Comments: I am not sure of the year on this pair but it looks like a 1970s pair. Comments: 1999 pair that I sold. They have a great color. Comments: This was the highest priced sale during the year. Surprising price. But if you want a new pair in your size, your options are limited. Comments: Made in 1978 and included the box. I would have bid on them if they were in my size. Comments: This pair went up for sale for $100 but the seller quickly cancelled the listing and relisted them at $389. Comments: Another Yuma. And another low Buy It Now price. Great looking pair of shoes. Nice color. Comments: Bad photos. Cordovan is misspelled. No width listed. And still the seller got $400 for the pair. Comments: “F.D.” is for Factory Defect. Its unclear from the photos what the defect was. The listing width was “D” but the title width says “C”. I hate that. Comments: Made in 1991. The only wide pair sold in 2016. Sorry Steve. Comments: New with Box. 1980s model? Sold quick due to the low price. Comments: 1966 version. This was my favorite NOS pair sold in 2016. The seller likely left some money on the table. Thanks for this (and all of the other great information that you post). I’m curious to know how you find the length of time it took a listing to sell? Thank you. I use eBay APIs to gather additional information such as the start and end time of the listings. Great review and thanks for the hearty laugh for the shout out on me missing the wide shoes! Well done! Gives me hope, seeing there were a few narrow widths available. I’ll keep on looking. Fantastic post! These are all amazing. But whaddya do with vintage shoes that are NOS? Display ’em? Treat ’em like an investment-grade collectible? David: Who are these people who constantly monitoring eBay for bargains? eBay shoe bargain monitor: How is this shoe unbought? The entire vcleat staff must be stuck in traffic waiting for today’s jumper to get off the bridge. That is a good point. I need to start blaming the staff for this failure. It’s management 101. Some images are sourced and/or served directly from eBay. I credit the listing when possible. Please contact me if you have an issue with an image appearing on the site.